SKU: 9999. 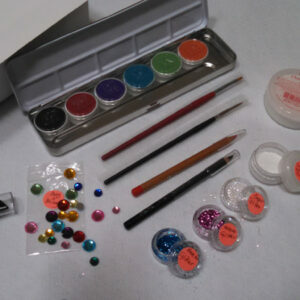 Category: Costume Shop Make-Up Kits. Tag: Zombie make-up. 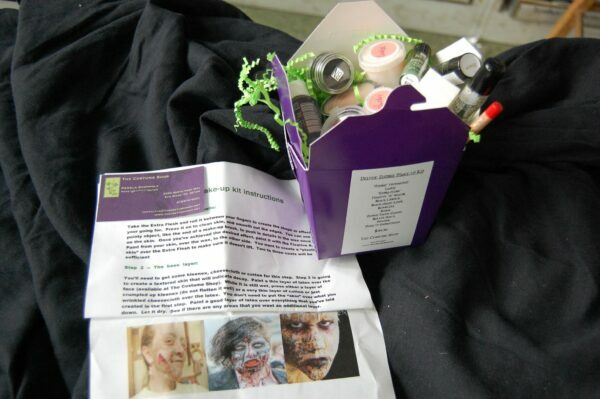 Zombie make-up kits designed and put together by the Costume Shop make-up artist. Everything you need to create a zombie face for your next Zombie Walk! Three types of kits available, depending on how elaborate you want to get! Kit includes grey-green foundation, black creme liner, black lipstick, blood, blood gel, “extra flesh” and fixative “A”, setting powder, a red pencil, a sponge, and step-by-step instructions on how to create your zombie face, along with pictures to give examples of make-up designs. More elaborate kits include latex, prosthetics and spirit gum! Be the first to review “Zombie Make-up Kits” Click here to cancel reply.